One of the very first things we did upon arriving at the Outerbanks was stopped by Jockey’s Ridge State Park. This is such an amazing site to see. Jockey’s Ridge is the tallest natural sand dune in the Eastern United States, and this year it even offered a little bonus. The shifting sand uncovered a castle that was part of an old putt-putt course that was there at one. It’s hard to imagine that Jockey’s Ridge almost didn’t exist for us to enjoy today. Back in 1973 while a couple children were playing nearby, they noticed a bulldozer was starting to flatten out parts of Jockey’s Ridge. When the kids saw this, they immediately ran home to tell their mother, Carolista Baum. Over the years, locals had talked about protecting Jockey’s Ridge from development, but it was just that. Talk. Nothing was ever done until that faithful day that Carolista Baum’s children ran home to tell her what was happening. At that point, Carolista planted herself in the path of the bulldozer and put a halt to what was happening. At that point, an effort to “save our sand dune” became important. That’s when the People to Preserve Jockey’s Ridge was organized, and Jockey’s Ridge was eventually made into a state park. When visiting Jockey’s Ridge, I would recommend arriving in the morning or evening hours, especially if you have little ones. Mid-day the sand gets pretty hot and can make for an uncomfortable trek. Ultimately we had planned on arriving early in the day. Let’s just say that didn’t happen. I knew what was coming when we climbed out of the bus at noon. It was already hot that day, and the sand on Jockey’s Ridge can be at least 10 degrees hotter than the outside temps. Luke had a harder time walking in the hot sand until we got to where the wind was picking up. That’s why we decided to make a game of it. He and his brother decided to dance, run and crazy walk. Not only did they have fun, but it helped to keep the hot sand out of their Crocs. As you’re walking on the path up to Jockey’s Ridge be sure to notice an area on your right if you have kids. Jockey’s Ridge is part of the Kids in Parks program, so they have fun little brochures that your littles can pick up. It makes the adventure more interesting and fun for them. Also, once you get back home. You can go online and enter your adventure. 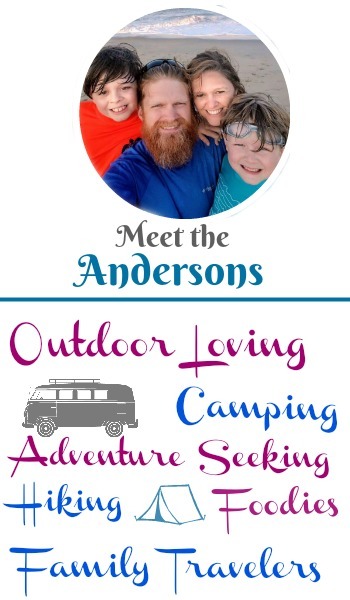 For each adventure entered, the kids get sent cool prizes. This year the trip to Jockey’s Ridge State Park had an added bonus. Over the winter months, the shifts in sands uncovered a castle that was part of an old putt-putt course that used to sit at the bottom of the ridge. It was pretty neat to be able to see that. Once you finish checking out Jockey’s Ridge, be sure to head into the Visitor Center. There is tons of educational information and displays in there. Jockey’s Ridge also offers a Jr. Ranger Program. Most of the Jr. Ranger Program can be completed from inside the visitor center and by visiting the boardwalk. The 384-foot boardwalk ends with a phenomenal view of Jockey’s Ridge. Along this tree-lined walkway are information panels that describe the various plants and animals that are found around the dunes. At the end of the boardwalk, you’ll find a bench for visitors that enjoy. • Admission and parking are free for Jockey’s Ridge State Park. Once there, you’ll find that they have several picnic shelters, grill, drinking water and restrooms on premises. 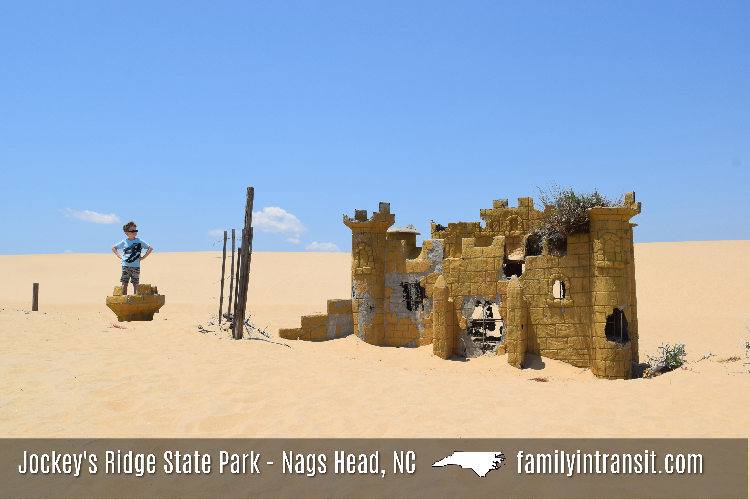 • If you are traveling with children, be sure to ask them about their Jr. Ranger Program, and also grab a paper heading up the trail towards Jockey’s Ridge for the Kids in the Park. • Jockey’s Ridge offers a 384-foot boardwalk that ends with a fantastic view and is handicapped accessible. • Transportation to the top of the dunes may be available until 4:30 PM pending availability. They do ask for a 24-hour notice.